Use Piwik PRO Event Tracking to investigate how your website visitors interact with rich media, forms, and buttons. What can you measure with Piwik PRO Event Tracking? 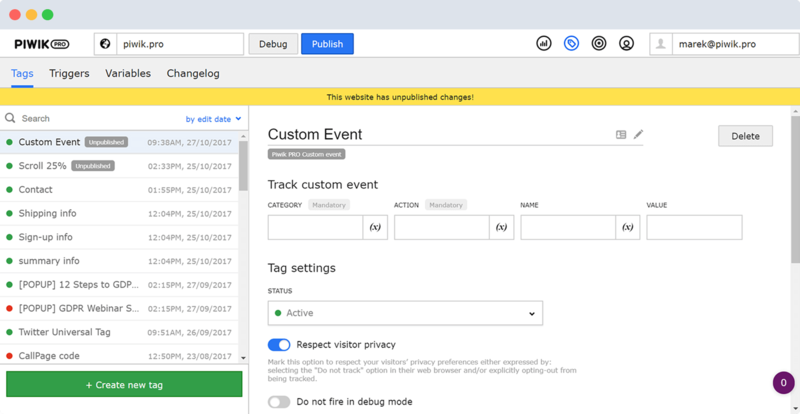 Event Tracking records user movement around your webpage and interaction with specific events like file downloads, even when a new pageview is not generated. You can also measure clicks on non-clickable elements of your website, track rich media like video and audio players, and review form performance on your landing and contact page. Use Event Tracking to optimize your website for better conversion rates. See how many times your video has been played, how many users finished watching it, and where they stopped. Find out how many people click on images, buttons and external links on your website to determine your visitors’ engagement level. Investigate how many people fill in your form and click form buttons, and learn which fields they abandon. Track custom interactions and behavior with Piwik PRO events for any data you want to capture. With Event Tracking you can identify how engaged your visitors really are. Piwik PRO Event Tracking provides you with data usually reserved for click tracking tools. Relying exclusively on aggregated data like bounce rates, time on page or page views doesn’t capture the full picture of user engagement. Event Tracking is all about generating maximum insight from your data to really understand your visitors. Use it to learn how users interact with your website’s elements like navigation, buttons, and forms so you can optimize your website for better performance. You can easily set events as goals without any restrictions on their number. Use this feature to track micro and macro conversions and to improve your organization’s digital performance. You can assign a numeric value to any tracked object based on what that particular event is worth to your business. Piwik PRO gives you the capacity to track how long users watch videos until they pause. Discover how many people watch your videos to the end or stop somewhere in the middle.